Colombian red-tailed boas live throughout Central America and as far south as Peru and northern Argentina. They can grow as large as 14 feet, although their length averages around 6 to 8 feet for males and 8 to 10 feet for females. As their name indicates, their tails have reddish spots or speckles, which eventually blend into their darker tan or brown coloration. LIke other constrictors, Colombian red-tailed boas can adapt well to many kinds of habitats. They’re found most commonly in clearings or fields bordering rain forests and around rivers, but they also adjust well to life near villages and fields, where they have abundant rodents to eat. 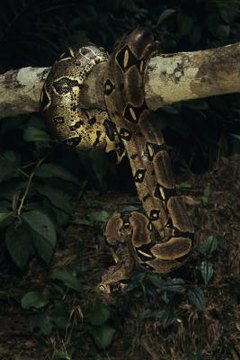 They aren’t limited to humid regions, either; Colombian boas can survive in semi-arid environments, such as scrubland and rocky slopes. They live as high as 3,300 feet above sea level and can endure cold snaps and drought by going into torpor. Both to hunt and to escape predators, they can climb trees, swim and retreat into burrows underground. Colombian red-tailed boas give birth to live young, usually between 25 and 50 babies, rather than laying eggs. They breed only when they’re healthy enough to nourish the embryos, probably no more frequently than every two years; females usually stop eating while they’re gravid, or pregnant, and draw on stored energy. If conditions aren’t favorable, a female also can hold sperm for several months, postponing fertilization until her offspring have a higher chance of survival. Pregnancies last from five to eight months, and females can wait to give birth if temperatures are too cold for youngsters. Babies usually measure 16 to 21 inches but grow as large as 5 or 6 feet within their first year. This rapid growth means that by the time they're a few months old, babies are no longer vulnerable to many predators. In the wild, Colombian red-tailed boas eat only live prey and not carrion. In captivity, though, they often can be trained to eat pre-killed food. They have fairly versatile tastes and might dine on bats, birds, lizards, monkeys, rodents, other snakes and wild pigs. Primarily ambush hunters, they attack their prey by constricting and then unhinge their jaws to swallow their food whole. They don’t need to eat often; one prey animal might satisfy them for a week, and after a large meal they sometimes don’t eat again for months. Unlike most other snakes, boa constrictors, including Colombian red-tailed boas, don’t have heat-sensing pits. Instead, they've adapted to rely on their flickering tongues to pick up odors. The vomeronasal organ in the roof of the mouth transmits these scents as chemical signals to the brain. Colombian red-tailed boas also can detect vibrations from movement on the ground and from sounds. They have excellent vision and can even see ultraviolet rays, enabling them to find sunny patches to bask on chilly days. At What Age Is an Elephant Full Grown? What Kind of Temperature Do Koalas Live in? What Do Baby Robins Eat Besides Worms?